One or more photo(s) has been virtually staged. Gorgeous MOVE-IN-READY Home in the Beautiful Panther Trace Community in Riverview! **Brand New Designer Laminate Floors** Walk in and be AMAZED! 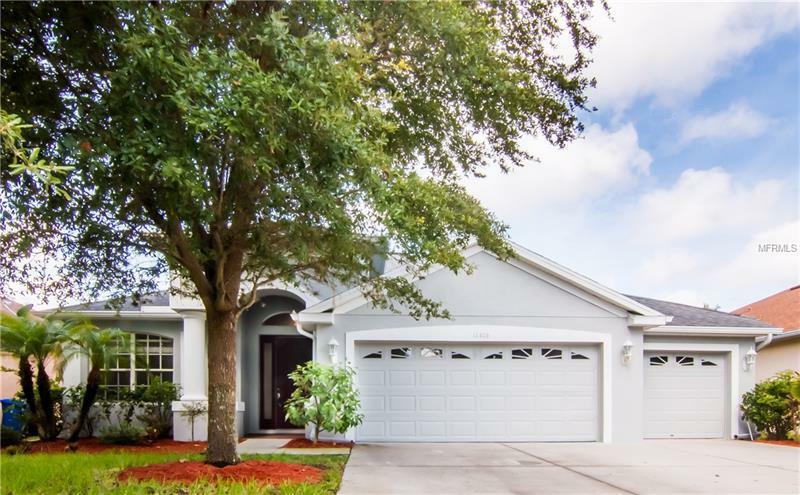 Large Living Areas, ALL Bedrooms on first level, Stunning Kitchen, Oversized Master Suite and a Jr Suite - great for Guests, Upstairs BONUS Room with half bath and a Patio to enjoy the FL lifestyle - outdoors! Bright and Open Living Room with Vaulted Ceilings, slider to back patio & Open to the Kitchen, Formal Dining Room, KITCHEN with Gas Range, Built-in Oven, Wine Rack, Breakfast Bar, Island, Solid Wood Cabinets, Stone Counters, Stainless Appliances, and Eating Area. Must See downstairs Master Suite with a Large Bedroom with slider to the back patio and huge walk-in closet. Master Bath with Dual Sinks, Garden Soaking Tub, and Walk-in Shower. 2 more secondary bedrooms and a full bath. 3rd Secondary Bedroom features its Own Private Bath and slider to the back patio! Downstairs offers a full Laundry Room with a sink. Huge Upstairs Bonus Room with its own half bath - You Can Create Your Own Space! The back patio and fully fenced backyard is a great place to relax or entertain family and friends. 3 Car Garage provides plenty of storage! Panther Trace has so much to offer including 2 Resort Style Pools, Splash Park, Multiple Playgrounds, Recreation Fields, Tennis Courts, Basketball Courts and More! ALL with a great Riverview Location - Easy access to major highways, schools, shopping, dining and entertainment. Come See this Great Home Today!